Our full service one-stop resource of Design & Construction services has been expanded throughout the Westside/Southern California region, as well as to specific multi-state resort cities. Being one of the pioneers of the Design Build system, BSA Design Build, Inc. has evolved from (26) years of combining the design and construction processes, into one cohesive project delivery package, that provides our clients with a pleasant and trustworthy experience. We have implemented this successful project delivery (please see Real Estate News Editorial Publication on our website under “Why Our Design-Build Concept Makes Sense“), for residential as well as light commercial projects. Now, we are poised to offer our clients these many benefits including cost savings, quality, and timely design and construction. Our first expansion project is underway for the Hawaiian Islands. The Big Island of Hawaii offers some of the most magnificent environmental qualities that are available on Earth. As an example, the weather in Kailua-Kona has often been described as an ‘eternal springtime’. It boasts a comfortable average temperature of 72 degrees, even during their ‘coldest’ month of the year in February. We currently have architectural plans 85% complete for construction of a new ground-up four bedroom/four bath custom home for Kailua-Kona, Hawaii. 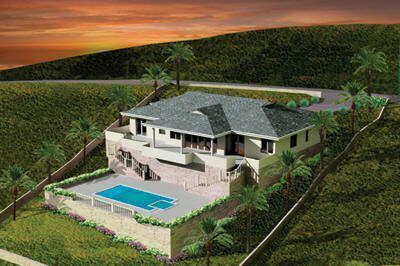 This home will be built on a 15,000 square foot parcel of land, commanding a magnificent, unobstructed view of the Kailua-Kona Bay. Amenities for this unique Hawaiian home include: green building materials/systems; energy efficient materials/systems; skylights; expansive glass door-wall systems that open the family room portion of the house for access to the adjacent 75 foot long outdoor lanai deck; double staircase down to the pool/bar/barbecue area; and ocean views from the kitchen/dining room/master suite/family room/entry/and game room. Additional qualities of this home include: bamboo flooring; solar energy panels; low VOC paint and sealers; custom etched glass entry doors; chef’s kitchen with two islands; a junior suite with private access; volume ceilings; and the site is perfectly situated in an exclusive subdivision with club access to tennis courts and walking trails. This site is conveniently located only 5 minutes from Kailua Town and its popular restaurants, shopping and cultural history. In addition, non-stop flights are available right in to the Kona Airport, just 20 minutes from this homesite. Similar projects are planned for other resort locations including: Corona Del Mar, CA; Newport Beach, CA; Malibu, CA; Beverly Hills, CA; Sun Valley, Idaho; Coeur d’Alene, Idaho; and Austin, TX. Our one-stop, all inclusive Design-Build services is available to you for this Luxury Home, with your personalized preferences a part of the plans.